It seemed not much over 12 years ago, it was a cold damp night as I sit under the arbor smoking a cigarette, into the darkness was a face with eyes as blue and green as the springs that form the Santa Fe River in North Central Florida, nothing more than your standard run of the mill mangy old looking cat was sitting there for me to see, I knew he was scarred, surely seeking a meal, perhaps a warm home, more likely his hard life on the streets of this small town has drawn him to me, perhaps he found a calm in my voice as I slowly lured him to me, day by day I would see him, night by night he came a little closer to me. A frightful sight to see, a body full of scars and scabs, I knew not what to think, my friends would say; My God John, what is that ? 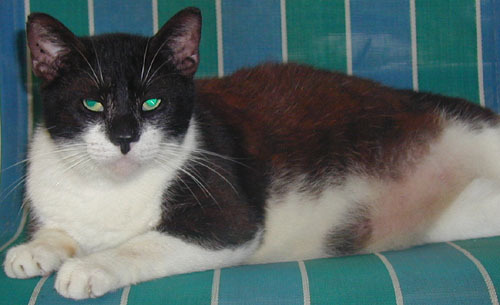 as the shine of dried blood worked to heal a fresh scar, stay away from that cat, I could not. Those cold damp nights continued to bring the sounds and echo's of the wild, all around my house, Owls would hoot with an eerie laughter, cats would rumble, deep into the night, the cry of a dog in the distance. This is the life the cat knew of, when was he born, I know not, where is the mother and father. One night, still cold and damp, I looked the cat into his spring filled droopy eyes, he would gaze into mine, I said I will catch you and help you, I will take you to the doctor, and you shall be ok, It took a large blanket to catch him and bring him down, he fought me, but I did not let up, I held on tight, and got that wild cat over to the High Springs animal hospital, I heeded a warning of the danger with this cat to Doctor Cohen, but she said, no problem, she has dealt with this many times before, it was at this Vet clinic, we named the cat General Patton, named from the battle scars of his life on the streets of High Springs, and also named for the scratches he left on Doc Cohen's hand. Many days and nights of home life with us has tamed General Patton into a wonderful friend, he kept his guard over the food bowl, and his front teeth, strangest thing you ever saw, the four front teeth were about a 1/2" long and would hang out of his mouth and rub his upper and lower lips, it didn't seem to bother him, as he would give a love nip at your leg for attention, you know, that little love nip would hurt too, one night after a fight somewhere out in the woods, he showed up with his upper left side tooth gone and his lower right side tooth gone, I always wondered what happened to the other cat. 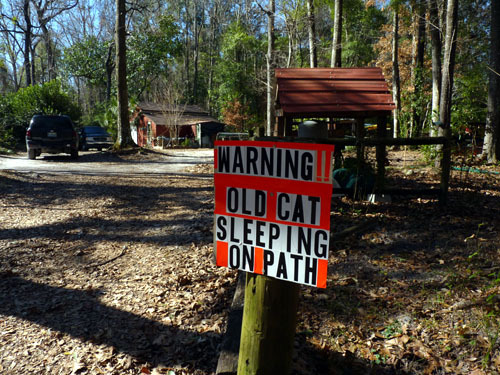 General Patton started acting a little strange when he would lay himself in 95 degree heat in the middle of the sandy driveway, all day and all night, he would not give up his driveway, I had to put up a warning sign for the delivery trucks and cars coming for a visit, the sign worked great, as everyone heeded the warning. Winter came, its still here, General Patton wanted to be held every time I got near him, now I know he was trying to let me know his time was coming to an end, he was giving me back all he could, he was saying good bye. 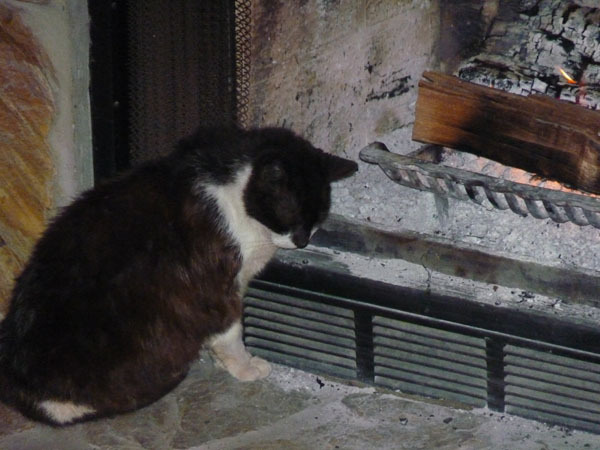 General Patton has had a difficult winter, he did not like the cold, he lived close to the fire place, at times I would have to keep the grill closed so he wouldn't get burned, we did all we could to keep the fire going, but his pour little lungs could not hold for much longer. I am grateful to have Doctor Cohen help me to lessen his suffering, and on this Friday 01/28/2011 at around 2:30, we have helped release his spirit to the heaven above, with God. Comforting, knowing Saint Frances once said, On the day of judgment, the Animals shall rise to judge us all, I believe I will be judged righteously, to have done my part, no matter how large or how small, to care for the strays as they show up at the door, we keep them warm, and fed, we give them love, they too, give us love, God blessed me with General Patton my cat. You too can find support here.